As investors, we’ve come to realize that any time there is positive news with regard to a publicly traded company, we can expect to see gains in the value of the stock associated with that company. This is especially the case when it comes to primary endpoints being met during studies in association with the biotechnology industry. The reality is that any time studies meet primary endpoints, we can expect to see incredible gains in the stock or stocks associated with the study. As a result, of the strong data from the Phase 2b study, we saw incredibly strong growth on VCEL yesterday. That strong growth is being followed up on today as well. Currently (11:27), Vericel is trading at $4.25 per share after a gain of $0.30 per share or 7.68% thus far today. Moving forward, I have an overwhelmingly bullish expectation of what we can expect to see from VCEL. The reality is that with ixmyelocel-T, the company is working on a treatment that is much needed in the medical industry. The promising results of all studies associated with the treatment thus far build excitement around the stock. This will likely keep VCEL climbing in the short term. However, it also means quite a bit for the long term. With the overwhelmingly positive results we’re seeing from the treatment, it only makes sense that Phase 3 will also go well, leading to a New Drug Application submission and ultimately approval by the FDA, which will in turn lead to profits. All in all, things are looking up for Vericel. Where do you think VCEL is headed moving forward and why? Let us know your opinion in the comments below! 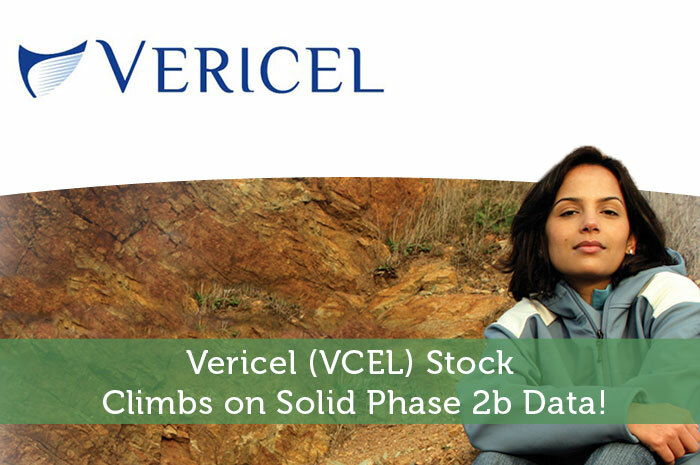 Vericel (VCEL) Stock Climbs on Solid Phase 2b Data!